Those who hold a Commercial Driver’s License (also known as a “Class A” license or “CDL”) are well aware that they are held to higher standards and greater scrutiny on the road. This remains the case even when a CDL holder is off the clock and driving for non-commercial purposes. One of the most impactful charges a CDL driver can face is Driving While Impaired, as the consequences for the driver are heightened even if the case never results in a conviction. 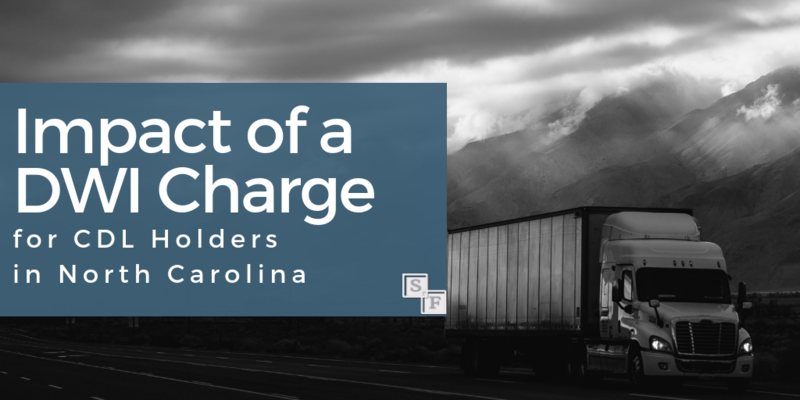 Here is a breakdown of the differences in impact of a DWI charge for CDL holders in North Carolina vs those who hold a standard Class C license. Most drivers who are charged with DWI will be impacted well before their case is tried thanks to North Carolina’s Civil Revocation Law. Under NCGS § 20-16.5, any person who is arrested or charged with DWI and provides a breath or blood sample of .08 or higher will immediately face a 30 day license suspension. This 30 day revocation also occurs if the driver refuses to provide a breath or blood sample. No conviction is necessary, and the state does not need to prove anything beyond a reasonable doubt for the suspension to occur. This is because the courts do not treat this suspension as a “punishment”, but rather a civil matter that concerns the driver and the DMV rather than the criminal courts. The standard is even stricter for commercial drivers. If a person is operating a commercial vehicle, a breath or blood test of .04 or higher is all that is required to trigger the 30 day suspension (CDL holders driving non-commercial vehicles are still held to the .08 standard). More importantly, under NCGS § 20-17.4, any civil revocation for a DWI automatically requires a 1 year disqualification to drive a commercial motor vehicle in addition to the standard 30 day suspension. If the CDL holder had a prior conviction that resulted in a suspension (for instance, a prior conviction for DWI, hit and run, or driving on a suspended CDL), this civil revocation could result in a permanent CDL suspension. Although these suspensions usually occur immediately upon being charged, NCGS § 20-16.5 does provide a limited opportunity to challenge the civil revocation. This challenge must be filed quickly, within 10 days of the start date of the revocation, or else it is waived forever. The grounds upon which the revocation may be challenged are also limited, so it’s important to get an attorney involved who is experienced in these types of civil revocation hearings. First time DWI offenders generally face a 1 year suspension of their Class C license upon conviction, with options to obtain a Limited Driving Privilege (LDP) provided they are over the age of 21 at the time of the offense. This is also true of CDL holders, but in addition to this standard suspension the CDL holder will face a 1 year disqualification of his CDL under NCGS § 20-17.4. North Carolina Law does not allow for a Limited Driving Privilege for commercial driving purposes, meaning a DWI conviction will strictly prohibit Class A driving for one year. CDL holders can still get a Limited Driving Privilege for Class C purposes. Similar to the civil revocation situation, under NCGS § 20-17.4 a CDL holder convicted of DWI who has a prior conviction for DWI, Hit and Run, Driving with a License Revoked, or certain other prior offenses can face a permanent CDL suspension. It is also important to note that the suspension for a DWI conviction is separate from the civil revocation suspension. This means that a CDL holder can be disqualified for 1 year based on the initial civil revocation before trial, and months down the road face an additional 1 year disqualification for a DWI conviction. Working as a commercial driver with a record of either a DWI conviction or a civil revocation is notably difficult. These drivers are seen as a higher risk to both employers and insurance companies. In some instances the DMV will place restrictions or conditions upon a driver such as a BAC limit of .04 or .00, or the requirement of an interlock device (also known as a “Blow and Go”), which severely limit opportunities for commercial drivers. If a DWI conviction or civil revocation causes a permanent CDL suspension because the driver has a prior conviction, the CDL holder has limited options and must usually wait a minimum of 10 years before they can petition the DMV to reinstate a Class A license. If you have been charged with DWI it is important to contact a knowledgeable attorney as soon as possible. This is particularly true if you have a Commercial Driver’s License, where missing the opportunity to challenge your civil revocation can have significant and long-lasting consequences.